In the latest step in the fossil-fuel-divestment debate, representatives from Brandeis Climate Justice and Faculty Against the Climate Threat met with the Board of Trustees last Wednesday to make their case. Though the Board did not reach a decision at the meeting, representatives from the groups told the Justice that they remain hopeful that the University will soon choose to divest. On April 3, 2015, the Brandeis University Exploratory Committee on Fossil Fuel Divestment released a report on the University’s potential divestment from fossil fuel companies, addressed to then-University President Frederick M. Lawrence. The committee, which included graduate student Phillip Wight, presented its divestment plan to the Board of Trustees in the spring of 2016. Wight, currently a fifth-year Ph.D. candidate in Environmental Studies, co-authored the committee’s report. The Board voted against the plan and the University’s fossil fuel investments have remained in place since 2016. During the past two years, the campus divestment movement has seen a renewed effort. Throughout that period, Brandeis Climate Justice has held multiple rallies calling for divestment, and in October 2017, FACT voted in favor of a resolution with the same call. In interviews with the Justice, representatives from FACT and BCJ expressed the importance of divestment and called for action on climate change. Prof. Sabine Von Mering (GER), one of the FACT representatives, brought up that while the University teaches students to take action on climate change, it has acted against those values by investing in the same fossil fuel companies it has encouraged its students to condemn. “Brandeis must divest from fossil fuels, because we teach our students about global warming. We train you to deal with global health issues ... We cannot at the same time take your money and invest it with fossil fuel companies who are using that money to spread lies about climate change,” she explained. Mudd and Prof. Paul Miller (BIOL), another FACT representative, think divestment is necessary because it would generate social change and bring renewed energy to the climate change movement. “Given the need for a mass societal change … the divestment movement is morally just and likely to propel change in the direction needed,” Miller said. Mudd also criticized those who remain apathetic about climate change. “In the face of enormous death, displacement, and economic stratification, the decision to remain ‘apolitical’ is in itself a political choice, one which condones the destructive actions of the fossil fuel industry and their role in spreading false climate science, endangering the health of frontline communities and lobbying against bold climate action,” he explained. Wight expressed that divestment would not only benefit the University, but would also further stigmatize the fossil fuel industry. Wight also emphasized the University’s social justice values as a reason to divest. He stressed that the University’s investment criteria forbid investment in fossil fuel companies, as they are not socially responsible. While some may express concern that divestment could have a negative financial impact on the University, Prof. Daniel Bergstresser (IBS), a third FACT representative, wrote in an email to the Justice that the financial hit would be marginal and would be outweighed by the need for climate justice. “All of these costs ... must be weighed against the larger problem, for me, which is continuing complicity with a process that threatens our planet and with an industry that has at times, behaved in ways that I think can safely be considered hostile to science,” he said. Miller added that by not divesting, the University’s reputation with increasingly activist-minded youth would be negatively affected, and that prospective students would not see the University as a leader in combating climate change. 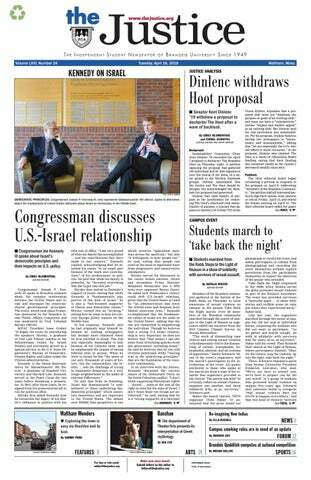 “By joining this movement early rather than late, Brandeis will gain positive recognition for standing up for its values, hopefully attracting students who believe the institution they join should have integrity,” he explained.